Very professionally conducted. Be aware that the trip starts from a Marina in Phuket and thus a long drive from Khoa Lak. All other aspects of the trip excellent. Recommended. 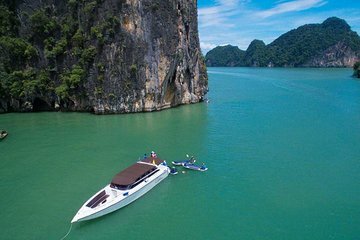 Overall this tour was a disappointment.First, it takes 2 1/2 hours by minibus to get from Khao Lak to the speedboat base at Phuket marina, each way. Second, the group is advertised as no more than 15 people ours was more than 20, so the boat was overcrowded. The snorkeling stop at Kai island was so overcrowded that you could not see a thing either above the water or below.At The kayak stop, the inflatable canoes were paddled by local boys which was fine but not what we expected our own kayaks paddled by us. However, the scenery at this spot was spectacular which made it worth while. The lunch stop at the Muslim village was the one bit of the trip that met expectations, the food was really good and plentiful and the village was interesting. Finally James Bond Is was overrun by visitors and although worth seeing this too was disappointing. On the plus side the boat crew were all very cheerful and enthusiastic guys who looked after their guests well despite some safety lapses. Regret that I cannot recommend this trip, particularly if you start from Khao Lak.